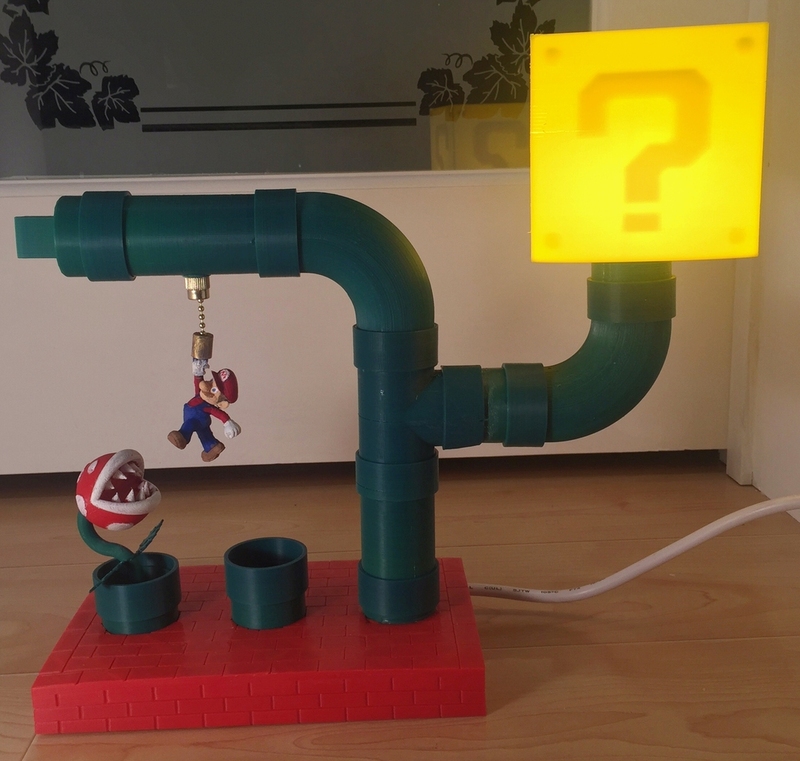 3D Printed Mario Themed Desk Lamp « Adafruit Industries – Makers, hackers, artists, designers and engineers! 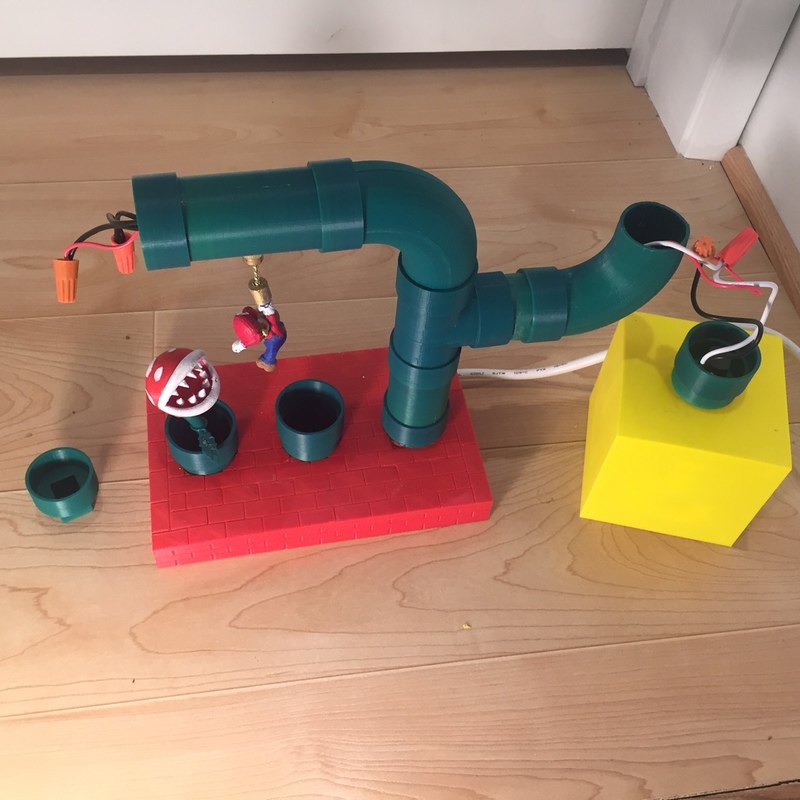 This is a project based on a number of similar lamps I’ve seen on the internet. Some were made of cast iron, some with ABS plumbing pipes. Mine is completely 3D printed. I used a free model of Mario called Mario (2) Trophy that I got from models-resources.com/download 3794. It was submitted by thegameexplorer and is from the game Super Smash Bros. Brawl. I had to do a bit of work on the .obj file before I could use it because it was open mesh. I wanted to modify it (to put the bead chain hanger on it). I also had to scale it up quite a bit because it was very small. I wanted to use the Mario question block lampshade by leethegeek – thing 954281, but it was too big and scaling it left the sides too thin. I had to recreate it from scratch. Wanted to give credit though. I also used Piranha pencil topper by BrandonW6 – thing 39443. All I added here was a stem for it. And lastly, I used rtideas thing 744570 strain relief (slightly scaled up to accomodate my power cord) to attach the cord to the deck. All the rest I designed myself.